The Whisky Shop (Unit 7 Queens Head Passage, Paternoster) was well within walking distance of our hotel. 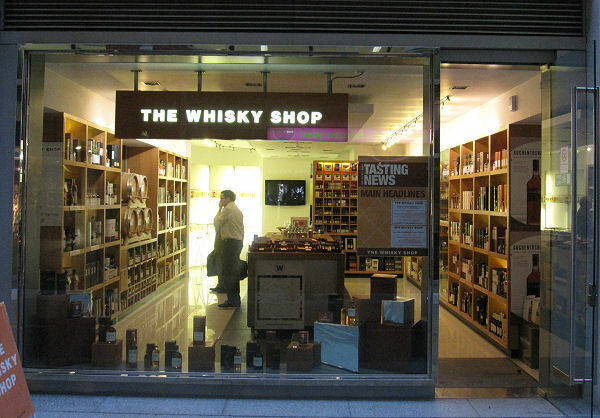 This shop in the city of London region is very sharp-looking establishment, stylish but not overly posh, and what's most important the whiskies are well presented in an easy-to-browse manner on the shelves. Why oh why don't we have such stores in Finland?! If our Alko dedicated even just one corner of their flagship store to Whisky, this is a shop they could look to as a model from which to follow fashion in style & presentation. We had the pleasure of meeting Mr. Matt Chambers who did a great job looking after us in his store. He was a most gracious host and truly well versed in all things whisky - what a pleasure to chat about whisky with him! We managed to spend several hours (!!) 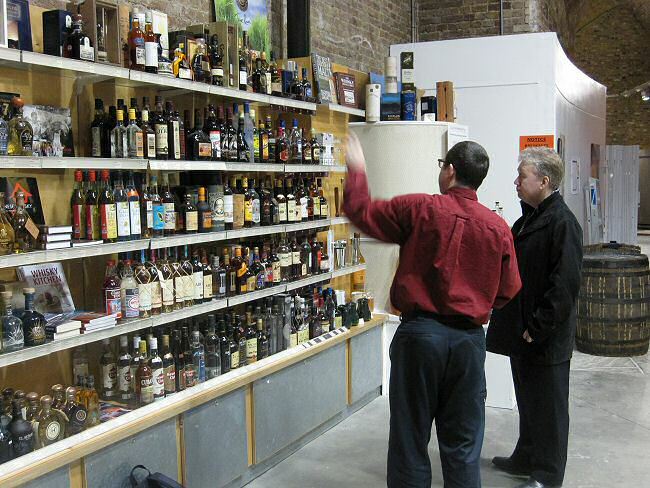 in the store, happily chatting about the bottlings etc. As the evening was dawning upon us already, we decided to walk towards Leicester Square and Soho. 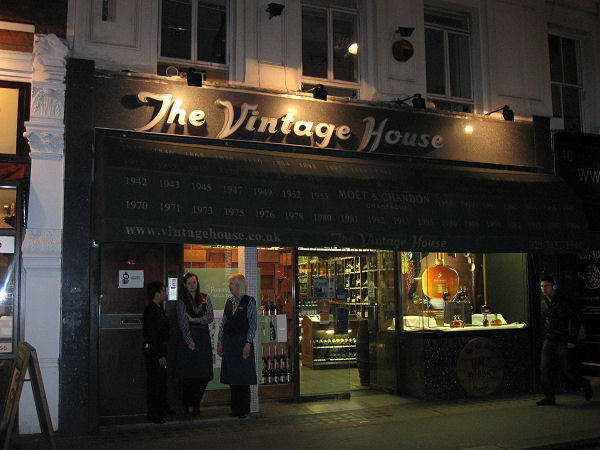 Milroy's had already closed, but from the Old Compton Street we found The Vintage House - a marvel of a whisky store, simply jam-packed with whiskies from top to bottom. Partly due to it's location in the centre of touristic London this store can indeed get very busy and be absolutely filled with tourists just browsing at the vitrines and shelves, with no intention of buying anything. Perhaps because of this constant stream of ogling visitors the service here may on occasion appear a bit impersonal or cold (compared to many other whisky shops, that is). The range of whiskies however speaks for itself - I've rarely seen such a multitude of bottlings in one place. The shop also has fine cigars, rums and other bits and bobs to satisfy one's palate. As our second day in London started we decided to walk over the Blackfriars Bridge and seek out The Vinopolis complex and in there The Whisky Exchange (1 Bank End). The shop was not going to open until 11am, so there was no rush. I was personally feeling slightly under the weather; the change of climate had left me with a bit of a flu. The brisk walk accross the bridge and the fresh air coming from the Thames river felt very good and soon we arrived to Vinopolis – 10 minutes before its opening time. Upon entering the Vinopolis we noticed just how vast the interior is. It took a few minutes to find the Whisky Exchange shop and on our way we also browsed upon the WIRSPA’s (West Indian Rum and Spirit Producers Association) rum showcase room – Very impressive stands and materials. In TWE we first looked at the product shelves in awe and then Smoke asked about a bottle of Bowmore he had reserved through the internet for himself. I soon joined the chat with the store manager Mr. Duncan Ross, only to realize he looked very, very familiar: I think we met already at Milroy’s many years ago and most likely also at the WoW Heathrow. Mr. Ross was very accommodating to us whisky enthusiasts from the far Northern corners of Europe and we chatted about all things whisky, rum and TWE. There were three small casks in the store and I had noticed already that one of them contained one of my all-time favorite whiskies, Rosebank. Mr. Ross kindly offered a small sample and I had to admit this was one of the finest examples of Rosebank that I have come across in a long time! Smoke got a taste of the Quite Young Ardbeg (also sold straight from the small cask) and we both agreed that there was no leaving the store without these whisky gems – and a few other bits & pieces...! Suffice to say, The Whisky Exchange was well worth the visit and it was a pleasure to meet Mr. Ross again. Stepping out of the store we noted that our feet were aching from all the walking the day before and in the morning, so we opted to look for a tube station. London Bridge was the nearest and from there we took the tube to Tottenham Court Road (via Bank). 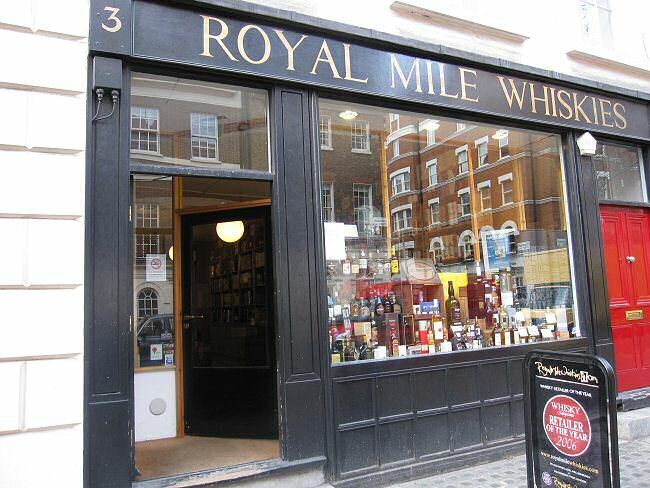 We decided to pop over to Royal Mile Whiskies (3 Bloomsbury Street) next. This is a relatively small store, a fact which may come as a surprise to those who have done business with the company over the internet. The staff present was friendly enough but on this visit no particular whisky managed to catch my eye, so instead I purchased Dave Broom’s impressive book “Rum.” Smoke found some Bowmore-flavoured honey and was quite chuffed with this curiosity item! The day was progressing rapidly and we had no time to waste. I had pre-purchased a bottle of the 30yo Brora through Justerini & Brooks (61 Saint James St.), very prestigious wine agents situated at St. James and we took the tube there so that I could pick up my bottle from their office. At the rather smart offices of Justerini & Brooks we were met by the lovely Ms. Hilary Howes who had assisted me with my purchase and now she had the bottle duly waiting for my pickup. She also gave us some kind advice as where to find our next chosen pitstop: Berry Brothers & Rudd. Berry Bros & Rudd (3 Saint James St.) was not far from Justerini’s offices. 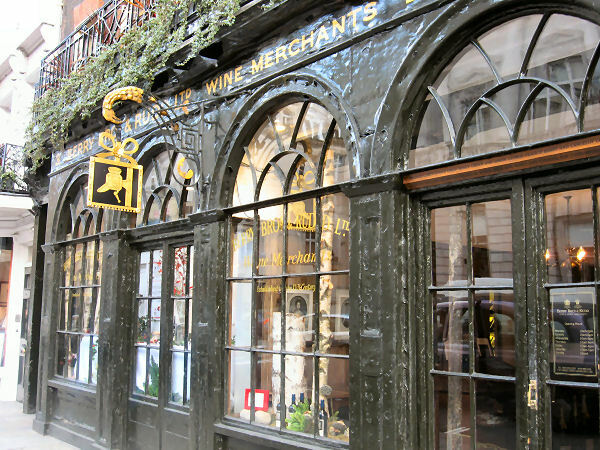 BBR is Britain's oldest wine and spirit merchant, having traded from the same shop for over 300 years! The store had a truly historical feel to it, with old wooden panels and ancient bottles sitting on the shelves here & there. The whisky selection was found in the far back room of the store – the room was not big, but by jove the selection was worth seeing! Berry’s own bottlings (whiskies selected personally by Mr. Doug McIvor himself) were plentiful and the store also had a selection of other (standard) bottlings, many of them quite rare. The staff appeared quite busy as there were other customers already buzzing around with them. I realized that with the bottles already awaiting for me at Milroy’s, my usual whisky store in London, there was sadly no way I could ever purchase the treasures at Berry’s on this visit. Smoke & I departed from the store empty-handed this time, but both of us agreed that this was a place to come back to one day. Taking the tube from Green Park to Leicester Square, we hurried to Milroy’s of Soho (3 Greek St.), my all-time favorite whisky shop in London. I have been going to Milroy’s since 1999 to buy fine whiskies and have seen the staff & store managers change over the years from Doug McIvor to Tim Errock and Duncan Ross. These days the store is excellently steered by Mr. Philip Shorten and Mr. Philip Kirk and although the staff has changed over the years, the impeccable customer service has always been and still is the trademark of Milroy’s, I feel. Sadly Phil Shorten was on holidays but Philip Kirk looked after us well on Smoke’s first visit to this store. We sampled the new Springbank Madeira wood release and had a sip of some Milroy’s bottlings as well. I had a ton of bottles awaiting for a pickup here, this is why we left the visit as the final leg of our whisky store journey. It is always a pleasure to visit Milroy’s and time flies when chatting all things whisky in this little oasis of peace in the midst of London’s busy Soho area. Thank you again, Philip and Phil! I look forward to doing business with you and Milroy’s. It was already almost 5pm as we departed from Milroy’s and I had a friend to meet in town (yup, he was bringing me more whiskies..!). Smoke took a quick detour to a stadium for some football memorabilia, I met my friend, collected more (!!) bottles and wobbled back to the hotel. At 7pm we rushed to meet a few Finnish friends of Smoke; they had come to town for a concert – we visited several very old pubs, ate a heavy meal, drank fine cask-conditioned real ales and had a very merry time in their company. The next day we still had some time to walk along the river Thames, but neither of us had the energy to even think of visiting another whisky shop – despite of the fact that we had missed out on Cadenhead’s whisky store (26 Chiltern St.), originally on our list. Sigh! There’s only so much one can do in given time, and our suitcases were laden with bottles already (thankfully Smoke helped me with some of mine, because being the greedy piggy I am, I had hogged too many bottles to fit my bags). But as we walked along the river on this glorious spring day (sun was shining and the temperature was about +15 celsius), we both agreed that it had been a very rewarding trip. 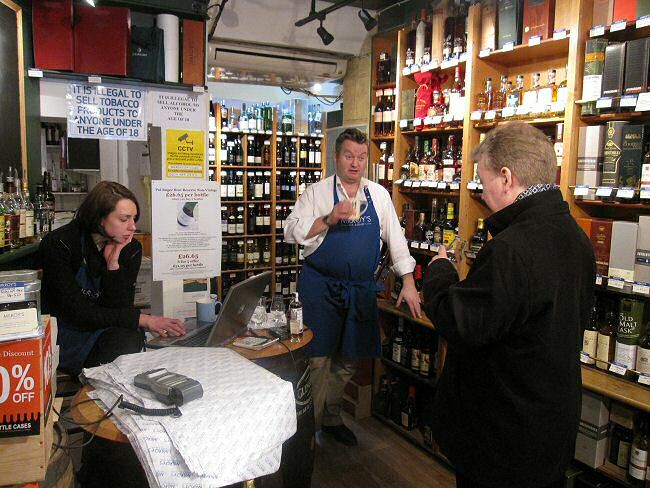 Discuss the Whisky Shops of London in the forums.